The growing application of image detection sensors in consumer electronics, automotive and healthcare sector is having a very strong influence on the growth of the global image detection sensor market. The technological advancements and the expanding application range of CMOS and CCD sensors, such as in lighting solutions and displays for tablets, PC cameras, mobile front and back cameras, and point-and-shoot cameras, are also adding substantially to the market’s progress. Over the forthcoming years, the rising usage of image detection sensors in photography application for consumer electronics is expected to drive the growth of the market significantly. The widespread application of CMOS sensors have in smartphone cameras, thanks to the single chip integration and the relatively low price of these sensors, is also projected to benefit this market in the near future. In 2015, the global image detection sensor market was valued at US$9.67 bn. Progressing at a CAGR of 9.60% between 2016 and 2024, the opportunity in this market is likely to reach a value of US$22.01 bn by the end of 2024. Although, the market looks flourishing at present, the declining demand of still camera may limit the demand for image detection sensors, hindering the market’s growth over the years to come. In terms of the technology, the global market for image detection sensors has been classified into thermal, charge-coupled device (CCD), and complementary metal-oxide semiconductor (CMOS). Currently, the demand for CMOS-based image sensors is higher than others. The scenario is anticipated to continue like this in the near future, thanks to the rising awareness among consumers pertaining to the advantages of CMOS, such as low power dissipation and single chip IC integration. Apart from this, the high cost efficiency of CMOS sensors is also projected to add to their popularity significantly over the forthcoming years. Over the next few years, the increasing demand CCD sensors from the healthcare industry is likely to boost the CCD segment while the rising application of infrared cameras for industrial usage is projected to drive the demand for thermal sensor. 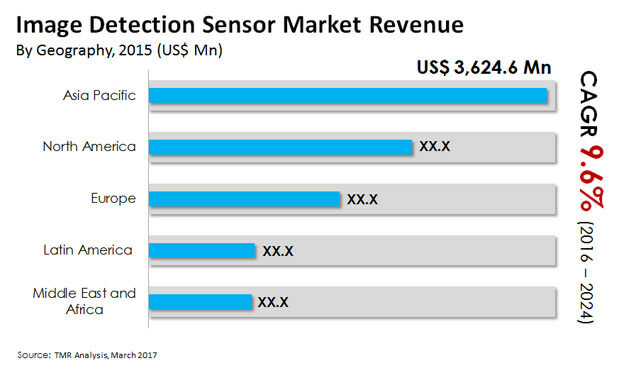 The Middle East and Africa, Europe, North America, Latin America, and Asia Pacific are the prime regional markets for image detection sensors across the world. Asia Pacific held the leading position in this market in 2015 with a share of more than 35% and is anticipated to remain doing so over the next few years. China, India, and Japan have emerged as the key domestic markets for image detection sensors in Asia Pacific. The increasing usage of image detection sensing technology in consumer electronics, automobiles, and defense application is likely to boost the Asia Pacific image detection sensors market over the next few years. The rising application of thermal sensors in the aerospace and defense industry is also projected to propel this regional market in the near future. In North America, increasing application in Internet of Things is considered as one of the prime driving factors for the market. The U.S. held the largest market share in terms of revenue owing to growing application of image detection sensors in consumer electronics, automotive and healthcare among others. Hamamatsu Photonics, ON Semiconductor Corp., Canon Inc., Panasonic Corp., Sony Corp., Teledyne Technologies Inc., Toshiba Corp., Samsung Electronics CO. Ltd., Omron Corp., Omnivision Technologies Inc., FLIR Systems, and Hikvision are some of the prominent vendors of image detection sensors across the world. Increasing technological advancement and continuously growing application of image detection sensors in the consumer electronics, healthcare, automotive and industrial sector is expected to have a very strong impact on the market for image detection sensors globally. Increasing usage of CMOS sensors for advanced digital cameras is having a positive impact on the market. CMOS primarily offer a low-cost alternative for CCTV cameras and point to shoot cameras. Growing usages of CMOS sensors in advanced driver assistance system in automotive sector and usage of thermal sensors in aerospace and defense industry are some of the major boosting factors for the Image Detection Sensors market. The growing usage of CMOS sensors in mirror-less cameras is expected to have a positive impact on the Image Detection Sensor market. In addition, rise in usage of advanced lithography technology in CMOS sensor for consumer electronics is another prime factor which is contributing in the positive development of Image Detection Sensor market. With technological advancement, different sort of fabrication technology with reduced power dissipation and improved signaling have been developed for CCD and CMOS sensors. These advancements are fueling the growth of the Image Detection Sensor market. Based on technology, the market has been segmented into three types CMOS, CCD and Thermal. The growing demand for smaller pixel size and improved fill factor in different digital cameras in order to enhance imaging quality is having a high impact on the market in terms of usage of CMOS sensors for consumer electronics. There is a significant rise in demand for CMOS area image sensor for x-ray imaging in healthcare industry since CMOS image sensors are best-suited for intra-oral x-ray imaging in dental diagnosis. Furthermore, this growing usage of CMOS sensors in consumer electronics and healthcare industry is likely to have a positive impact on the expansion of the market. Growing usage of CCD sensors in wearable devices is expected to have moderate impact on the market .In addition to that, growing usage of thermal sensors in machine vision technology and thermal imaging is also going to create high impact in the Image Detection Sensor market during the forecast period from 2016 to 2024.Based on application, the market is segmented into imaging and photography. Geographically, the Image Detection Sensor market is categorized into North America, Europe, Asia Pacific, Latin America, Middle East and Africa. The market for image detection sensors has been provided in (USD million) in terms of revenue and (Million units) in terms of volume as well as the CAGR for the forecast period of 2016 to 2024. The key players in the image detection sensors market have been competitively profiled across the five broad geographic regions. This competitive landscape is inclusive of the various business strategies adopted by these major players and their recent developments in the field of image detection sensors. Further, the report includes the market attractiveness analysis of different technology of image detection sensors and insight into the major application area of the image detection sensors. The report also provides assessment of different drivers that is impacting the global market, along with the restraints and opportunities that has also been covered under the scope of this report. For each segment (such as technology type, applications, end users), market dynamics analysis has been provided. All these factors help in determining different trends that has been impacting the overall market growth. Moreover, after taking into consideration all this factors, an extensive analysis of the region wise growth parameters of Image Detection Sensors market along with the overall assessment for the forecast period of 2016-2024 has also been provided within this report. Furthermore, the report includes the porter’s five forces. Some of the leading players operating in the market are Hamamatsu Photonics (Japan), ON Semiconductor Corporation (The U.S.), Canon Inc. (Japan), Sony Corporation (Japan), Teledyne Technologies Inc. (The U.S.), Toshiba Corp. (Japan), Samsung Electronics Co. Ltd. (South Korea), Omron Corporation (Japan), OmniVision Technologies, Inc. (The U.S.), Panasonic Corporation (Japan),FLIR Systems (The U.S.), Hikvision (China) ,Fluke Corporation(The U.S.), Festo (Germany), Cognex Corporation (The U.S.) and Texas Instruments (The U.S.) among others.